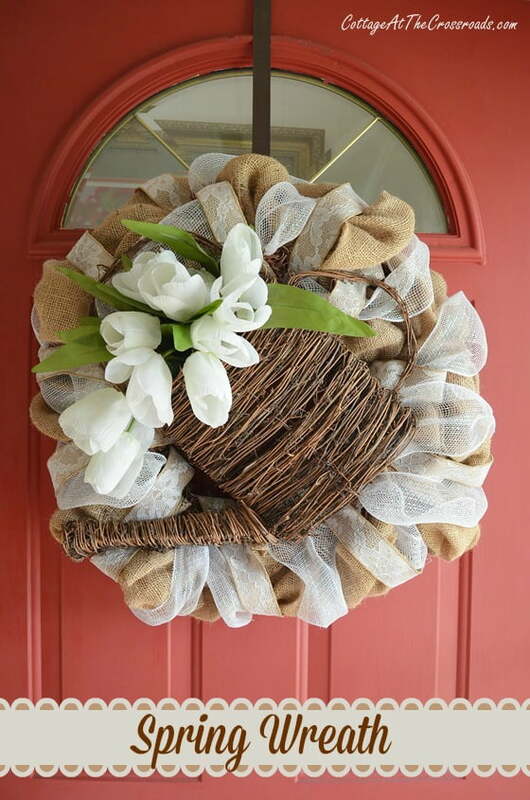 I’ve had this spring wreath made for a few weeks now, but I hadn’t put it up yet because of the pollen. We’re surrounded by trees here at the Crossroads, and when they bloom, we are blasted with the pollen they release. I had started decorating the front porch with a neutral theme before the pollen arrived. You can see the beginnings of my efforts with my Neutral Bunny Tablescape. And then the yellow haze descended. I’ve learned that it’s just easier to let it happen, and when it subsides, to thoroughly clean everything on the porch. Pollen season is just about over here and the rain that’s expected today will clear the air. So yesterday, we removed almost everything from the porch and pressure washed all of it. 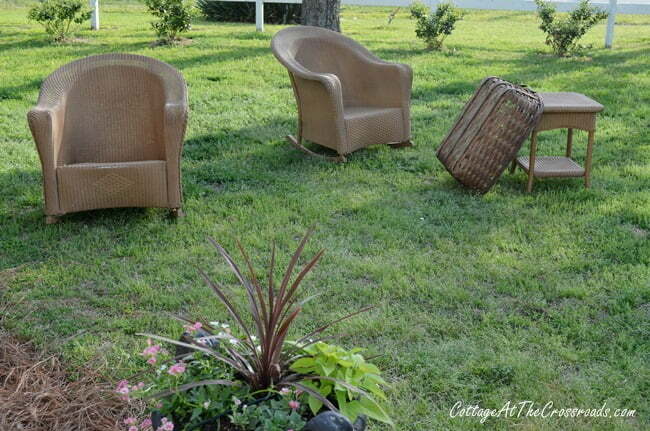 We just put all the furniture in the yard to wash it. It dries in the sunshine for a few hours and then we move it back. Everything gets sprayed on the porch including the walls, the ceiling, the screens, and the outdoor carpet. See? 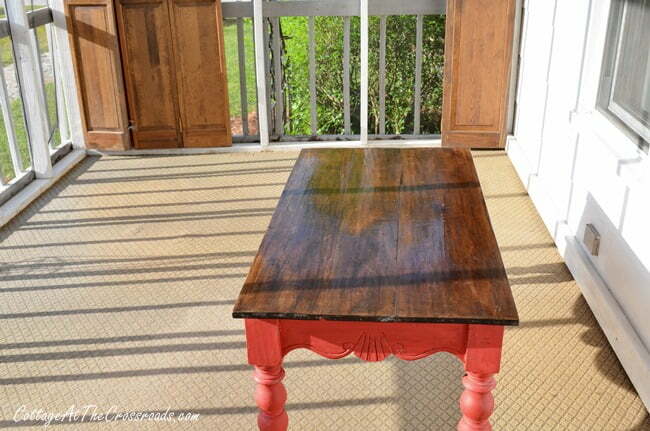 Pollen is all gone now and the furniture has been moved back onto the porch. All the cushions got vacuumed or washed and now I’m back to decorating for spring. The wreath is part of a display around the front door. The grapevine garland surrounding the front door has now been up for over a year and has been through many seasons and holidays. It gets redecorated each time, and this is just the beginning of this one. By using the neutral colors, I can extend the time that it can stay up. The base of the burlap wreath is one that I used last year for my Fourth Of July Wreath and Door Display and again on our Fall Porch. 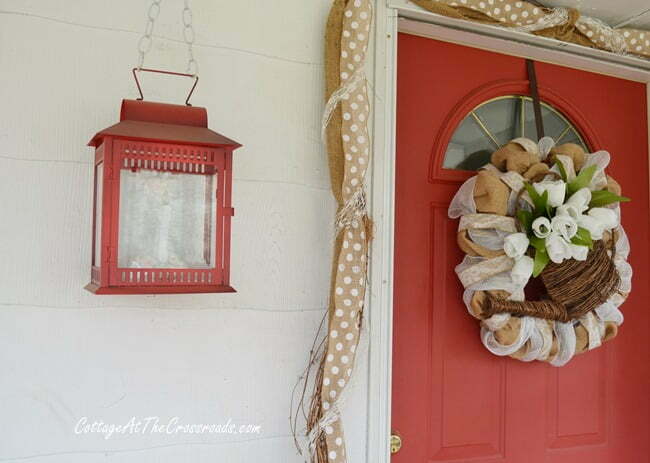 This time I embellished it with some new lace burlap ribbon and some white mesh that was used on our Christmas Porch. I found the grapevine watering can and the lace ribbon at Carolina Pottery months ago. 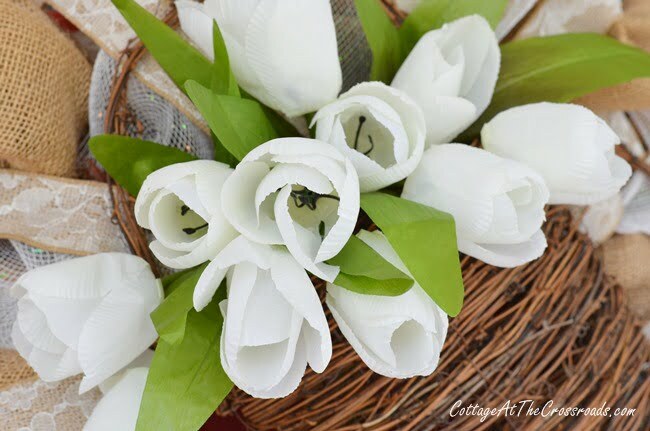 The white tulips I picked up at Hobby Lobby. If the pollen weren’t gone, they’d be yellow tulips shortly! So glad we got the porch all clean so I can finish decorating it for spring! Here in the piney woods of east Texas I just wait until May 1st and then I am guaranteed all the pollen is gone. We call it one of our 5 seasons. . .the season of pollen. Oh my gosh Jane that pollen is crazy! Not sure which is worse…that or snow. lol. 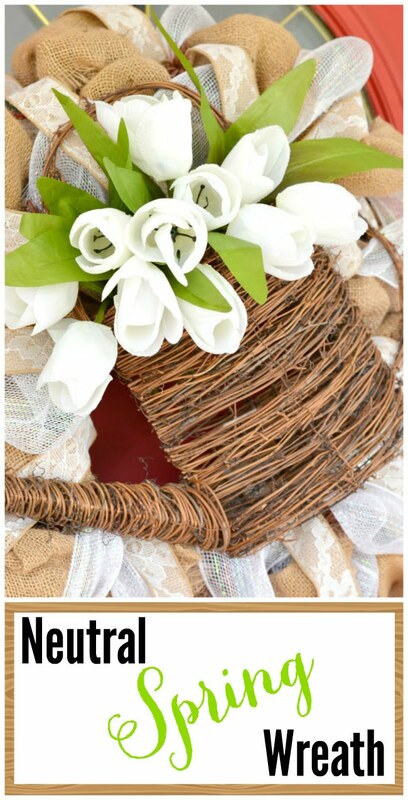 I adore that watering can and how you used it in the wreath is so cute. 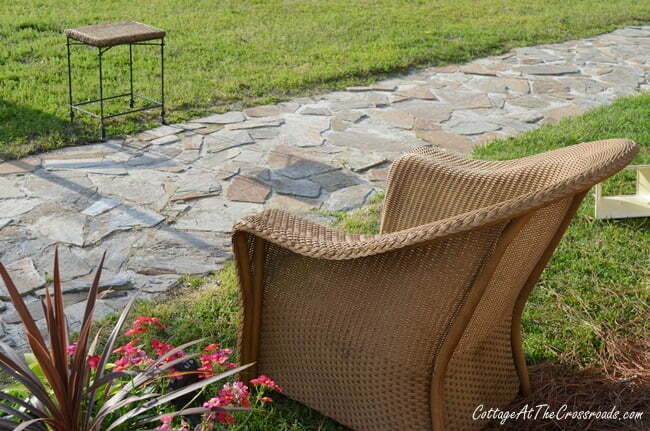 Glad you will be able to start enjoying porch weather! Beautiful wreath and I love your porch. We’re smack in the middle of pollen season here and can see “yellow” gusts of winds across highway 70. So many people are suffering with allergies right now. Keep up the great blog. I always enjoy my visits here. What a cute wreath! I love the little watering can!! 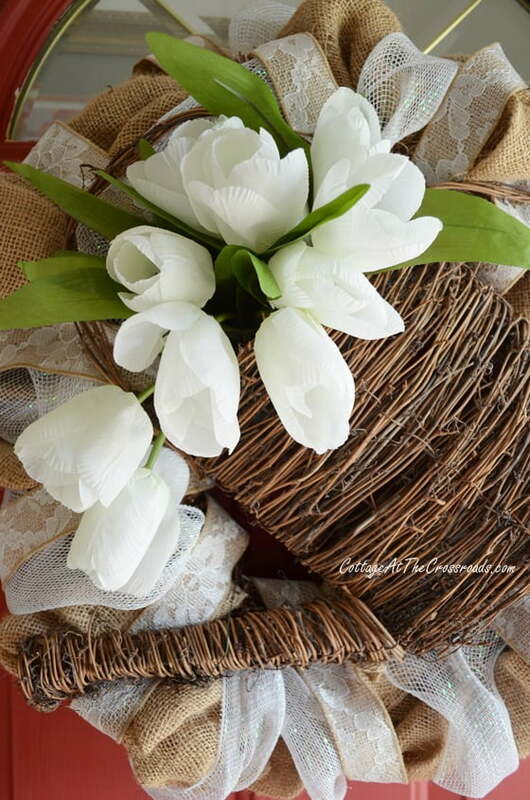 Jane, I love your wreath with the burlap with the white tulips. Lovely Spring porch. Our pollen season has not started yet. We are supposed to get two inches of snow today. The daffodils were already blooming in the yard so I cut them for bouquets rather than have them flattened by the heavy wet snow. Beautiful wreath! Your porch always looks so pretty! Our pollen is just getting bad, so a couple more weeks before we can pressure wash. Everything looks so good when it’s done, though! Hope you enjoy the remainder of your decorating on the porch. Can’t wait to see it all! I can sympathize as everything is covered with the yellow stuff. Your wreath is so pretty! I’m new to your blog. I found you via Savvy Southern Style! I just love the wreath on the door. I saw something similar to the watering can at Fred’s Store. I think now I will go back and get it! The pollen is awful! I’m hoping this rain washes a good bit of it away. 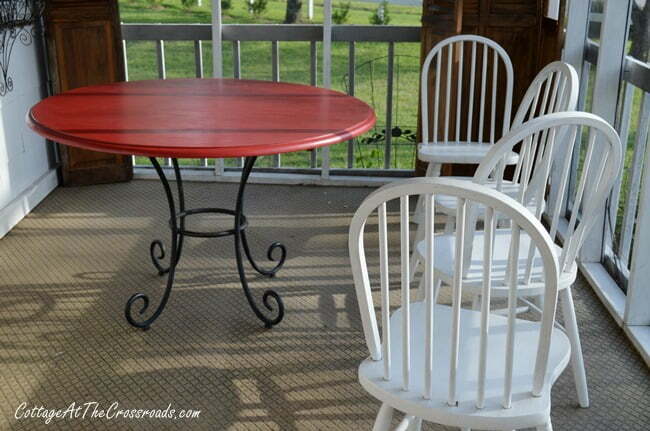 I like the round table on your porch. I will have to be on the lookout for one for my porch. I have a perfect corner for it. I will be back to read more of your posts. Love your wreath…what a darling watering can. 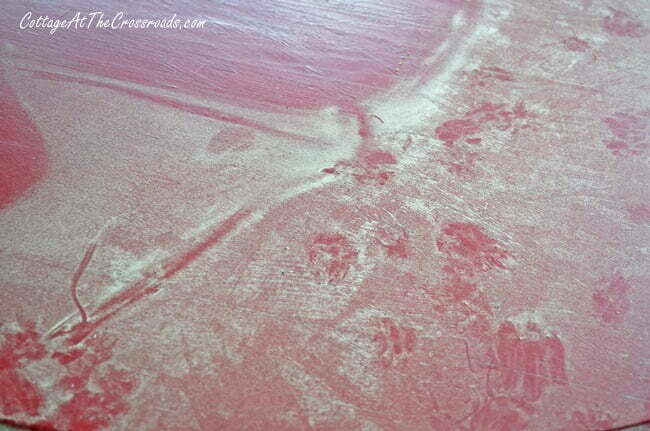 Pollen is still coming down here…can’t wait till it stops…my screen porch is yellow! Your wreath that you made is gorgeous, I’ve pinned it to my board “Great Wreaths for Any Season”! That is so cute, Jane. I love the watering can. What an adorable Spring wreath for your porch!!! 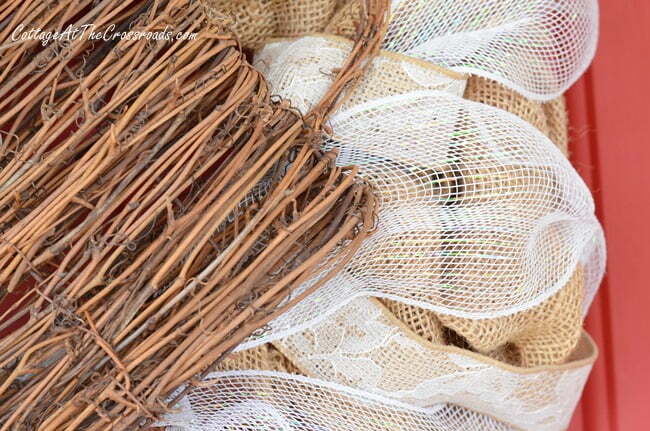 I love how you worked the wicker watering can into the design!!! I’ll be back to see more of your porch all decked in its finest Spring decor!!! Jane the porch looks wonderful and I love the colors! Cute decorations!